I was not expecting this. Something in the “New 52” that exceeded expectations – I never thought that would happen. It has, and that makes me hate life a little less this week. I think the biggest surprise to me was that it was with a book that I was so sure was going to be terrible. Green Lantern #1 made me smile. This is Geoff Johns doing what he does best, and he does do this best. Hal Jordan is Mr. Johns’ soul mate this much is clear. They understand one another and it comes through in every page of this book. Sinestro might be my favorite villain of all time. That might be a hyperbolic statement, as there are so many excellent villains in the world of comics. However, this holds absolutely true in this book. How do you mess with arguably the greatest villain in the universe? You make him be a good guy again. I thought that it was so much fun to watch Sinestro squirm and fight the Guardians on his new position as a Green Lantern. I loved the level of contempt that Sinestro displayed when the ring chose him, and how much he wants to get rid of something that he used to want so badly. 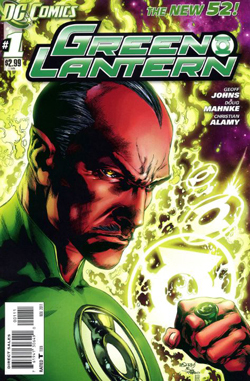 Let’s not forget that he has Hal’s old ring, aka the ring of Abin Sur, who was Sinestro’s mentor. Speaking of Hal, what is going on with him? He is human right now. I suppose that he’s always been human, but I loved seeing him as a man. One of my favorite DC couples (or non-couple, as it is the majority of the time with these two) is Hal Jordan and Carol Ferris. I love watching them interact, specifically I love how Carol deals with Hal. He’s so much sometimes, but she knows that and still loves him. He can’t love her the way he wants to, because he is so obsessed with being a Green Lantern. Maybe that’s not being fair to either of them, but that’s how it works. Getting a chance to see them spend some time on Earth together was amazing for me. Hal’s in some real life problems and isn’t dealing too well. I liked that. Good writing, Mr. Johns. In the end, I thought this was a great way to reboot the Green Lantern series. Hal has become a real person with real problems again. The twist provides a great jumping off point for future books. I’m sold on this new version, and I hope other books in this “New 52” can provide hope for me and my DC Universe. Frankly, I’m more relieved than anything else. Good work, Green Lantern #1.